Werk is working to close the leadership gender gap and improve recruitment, retention, and promotion of women through flexible, leadership-track careers. 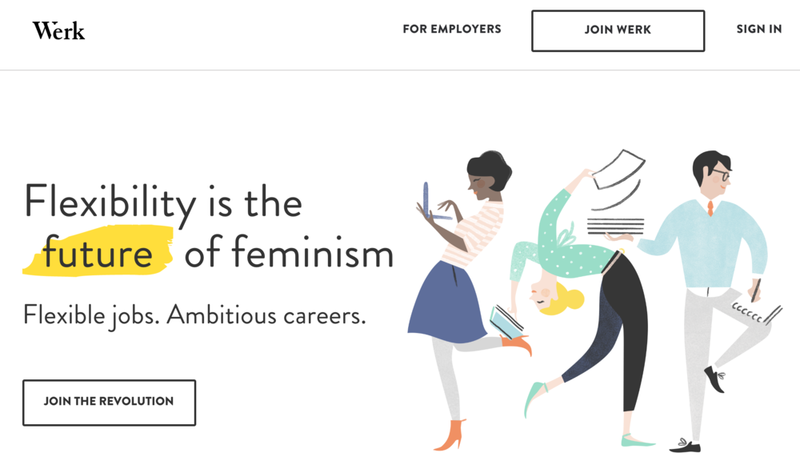 Werk connects talented job seekers with prenegotiated flexible work positions at private companies that accommodate for mid-career professional women with families. Werk currently offers six innovative ”flexibility products” that feature different work-life compatibility arrangements, such as working remotely two to three days per week or working non-standard hours. Companies agree to these products through advanced negotiations with Werk and can then feature them in job descriptions that members of Werk’s online job board can apply for. Even though Work does not focus on STEM jobs specifically, but their job offerings are often at forwardthinking tech companies. between career and family. They estimate that 30% of women ”opt down” or ”opt sideways” into nonpromotion track careers after having their first child. Yet research shows that 70% of these women would have stayed had they been offered more flexibility. While many companies do offer flexible work policies, very few employees utilize these options, often because doing so would leave employees out of consideration for promotion. address the problem directly, and Werk does not believe that more leadership training and networking workshops will solve this ongoing challenge. Instead, Werk addresses this underlying environment by pre-negotiating flexible work arrangements with a strict leadership track requirement. Unlike other flexible or remote work job sites, Werk requires positions listed through their platform to be eligible for promotion, rather than one-off projects or gig roles, which do not usually offer the same opportunities for promotion and advancement. first participant in a position six months after inception, and is now planning a ”flexibility credential” or ”flexibility pledge” among companies to galvanize more companies to formally recognize the importance of flexibility in the future of work.